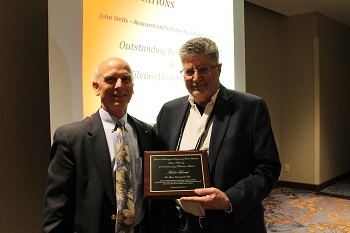 John Wells, CTETE Research Committee Chairperson, presenting the Silvius-Wolansky award to Michael Hacker, accepting on behalf of Moshe Barak. Our signature award, we annually recognize one individual, nominated by the membership, whose contributions in teaching, research, and service to the progression have been exemplary. 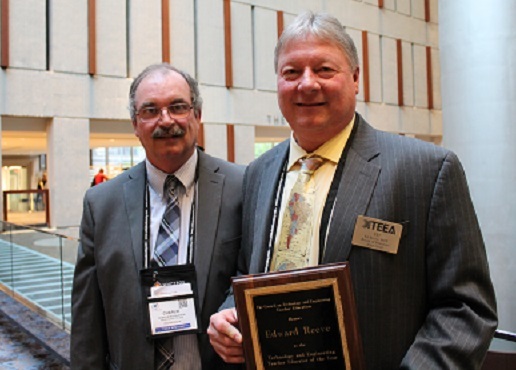 The awardee for 2018 was Dr. Edward Reeve of Utah State University. Recognizes one member (or members, if co-authored) annually for outstanding contributions in published research. The 2018 awardees were Dr. Scott Bartholomew, Purdue University, and Dr. Edward Reeve, Utah State University. Co-sponsored by the G. Harold Silvius Foundation and the CTETE, this award is presented annually to an author (or co-authors) whose scholarship has enhanced the Technology and Engineering Education profession. The 2018 awardee was Dr. Moshe Barak, Ben-Gurion University (Israel). Co-sponsored with the ITEEA, this award is given to an individual or team of collaborators whose work has effectively promoted the use of technological/engineering design-based education at the K-12 level. The 2018 winners of this award were Drs. Scott Bartholomew, Todd Kelley, Nathan Mentzer, and Greg Strimel, all of Purdue University.